Attack on Titan Season 3 Episode 01. 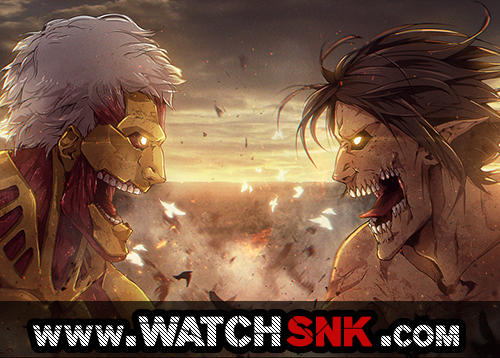 Watch Attack on Titan Season 3 Episode 01 in High Quality HD online on http://ww3.watchsnk.net. You are watching Attack on Titan Season 3 Episode 01. Click here to Download Attack on Titan Season 3 Episode 01!! Click here to Watch Attack on Titan Season 3 Episode 01 on AnimePill!! Time for some “Legends of the Titan King”. Would be cool if the Coordinate power was simply the power of the King. Wtf I mean they cut all the LeviHan scenes???! WHY IS THERE NO HD EP YET??? This is cinema print,official release will come out later. i don`t know why i m happy to see the countdown but i am xd. LMAO did I just see someone legit used a cam! like, bruh. Why does the countdown indicate its coming out on monday?? Why does it say 3 days?! I thought it was supposed to be the 22nd? I think this website has lost its mind. According to wiki, its 23 july. Yeah they reduced it by 24 hours i think. Here we go again! I’m really excited. Thanks again to the people of this website! I guess this is the fastest presently. Kissanime will take 1 or 2 hours to download, rip and then post it from Crunchyroll. And Crunchyroll is gonna stream it at 8:35AM PST. So, Kissanime would air it by approx, 11AM PST. We got you fam, we will stream it at exact same time as crunchy 😉 Dont worry. But will it be subbed already or not ?? Check other tabs,its camrip for now but we will update better version soon. crunchyroll says 11 am PST, where did you see 8:35 AM? Is the episode going to be subbed? Yeah the episode is gonna be subbed, dub comes out August 18th. he meant if its going to be RAW or subbed. The title says “Attack on Titan Season 3 Episode 01 Subbed” so we’ll see about that I’m sure.. There was a livestream but I only watched the ending. I really liked this opening, even though i think it’s kinda really happy for the arc, kinda fits with the change of tone of this arc. Is it with english subs in 30 minutes? Is the whole season 3 coming now or only the first episode? are you gonna upload the raw or do we have to wait for subs? damn, tf did they do to him? why is the countdown time increasing instead of decreasing? We have updated countdown and added CAMRip version. will it be subbed this time? is it coming in 38 minutes? We have added non-official Subbed,refresh. Man so tell the exact time of posting of episodes………..is it 10:30 or something else?? When is subbed coming out? First episode is mostly like this,no confirm timing but from next week,countdown will be perfect. Talk about cliffhangers. Next episode: Half of it will be memories about Kenny from Levi and the rest will be Levi cutting up some people. Then the episode after that he’ll fight Kenny. Not sure how I feel about this episode… They skipped so much – the Reeves company, Historia’s backstory, the explanation about what happened with Eren’s experiment. Maybe they want the next arc to have more episodes? And I always dislike it when the strongest character happens to be crippled in a critical moment just so that he can be on par with people he’d otherwise beat in a second. Just so that the plot can be extended. Its supposed to make it exciting, but it never is for me. Anyways, thanks for the episode, and till next week!